Today’s Home, a social network-based home interior information platform, and “Black Desert Mobile,” a hit mobile role-playing game from Pearl Abyss, were named the top mobile apps in South Korea for 2018 by Google Play on Thursday. Every year, Google’s mobile app store operator recognizes outstanding apps in various categories ranging from lifestyle and commerce to social networking, finance and games. Among the apps considered by Google Play for the Korean market this year, Today’s Home developed by Bucketplace Inc. was recognized as the best app of 2018, while “Black Desert Mobile” was named best game of the year. Launched in 2014, Today’s Home lets users post pictures of their home interior designs, and provides links where people can purchase the furniture and home decorations shown in the pictures. The platform has so far racked up 1.5 million downloads on Google Play, and is currently the No. 1 app in the real estate/home interior category in the app marketplace. Meanwhile, “Black Desert Mobile,” a mobile rendition of Pearl Abyss’ popular massively multiplayer online role-playing game “Black Desert,” has topped the Google Play store’s game category since its launch in February this year. 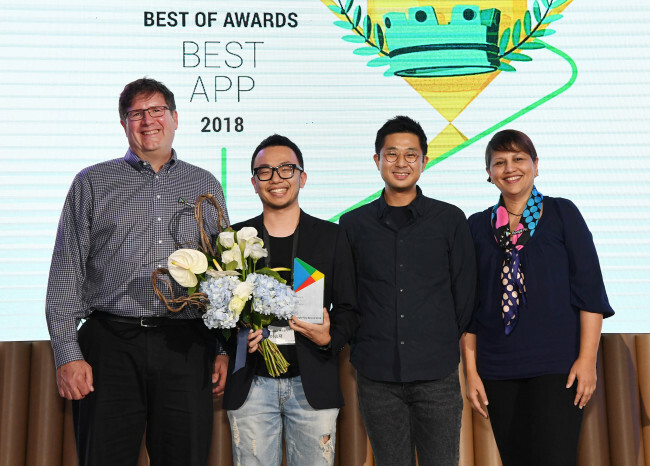 Other apps that received awards include video platform TikTok for the entertainment category, Superman for the self-improvement app category, e-commerce app Market Kurly for the lifestyle category and Triple for the “hidden gem” category. Other game apps awarded by Google Play include “PlayerUnknown’s Battlegrounds” by Bluehole-owned PUBG, puzzle game “Zombie Sweeper,” “Cosmic Wars” for the indie game category and “We Bare Bears the Puzzle” for the casual games category.